Gluten-free pumpkin bread made in the slow cooker. When you love your slow cookers as much as I do, you want to make everything in them... including quick breads. Why? Well, because it's super easy, it can cost less than using your oven, and most importantly... it's FUN! And gluten-free baking should be fun right? And even better the slow cooker steams your bread so it's super moist and delicious. For most of the breads in the cookbook and this recipe I used my favorite 4 quart slow cooker. It's perfect for making one batch of quick bread, and in this case... pumpkin bread! The only additional equipment you need to make this bread is three aluminum cans. 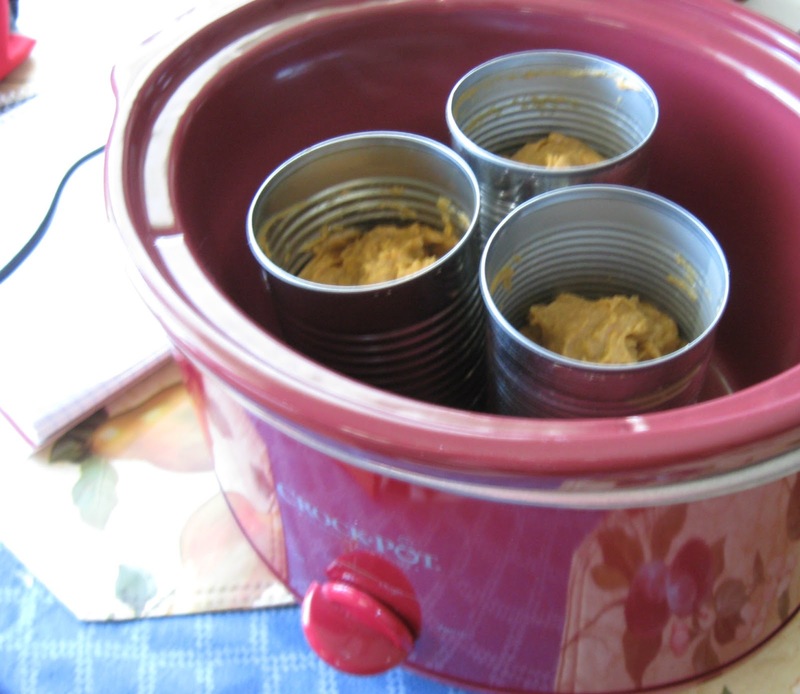 Preferably cans that would hold about 15 - 15.5 ounces (generally from canned veggies, beans, or fruits). I've used these same three cans for about 2 years. They last forever and they are easy to clean and re-use. Wash the cans out with very hot, soapy water using a baby bottle brush. CUT any sharp edges OFF of the rim of the cans with heavy duty metal cutting shears or scissors. This is why it's good just to create a "set" of cans to use, so that you don't have sharp edges to worry about time after time! Make sure to completely remove the paper wrapper and the glue residue on the outside of the can before using to cook with. Before each use spritz the inside of the cans with non-stick cooking spray or use a paper towel to wipe olive oil or coconut oil evenly inside the can. By greasing the cans the bread shouldn't stick to them when baking. To make the bread you will simply add 1/3 of the bread batter to each aluminum can and place the cans in the slow cooker. The cans will be anywhere from half to 3/4 full. Add about 1/2 cup - 3/4 cup warm water around the bottom of the cans to steam the bread and prevent the slow cooker from cracking. Place the lid on the slow cooker and then slip a chopstick right underneath the lid to help excess moisture escape during cooking. When the bread is finished it will be cooked through and a toothpick inserted in the middle will come out clean. Allow the bread to cool for a few minutes in the slow cooker with the lid off. You can then carefully remove the cans using a potholder or kitchen tongs. To remove the bread, just shake the can a little and the bread should slide right out. Alternatively, you could also used the "canned" bread as a homemade gift by wrapping it decoratively in colored paper and tying it off with a pretty ribbon! For more recipes like this gluten-free pumpkin bread and to learn more creative ways you can use your slow cooker, please check out my brand new cookbook! Spritz three (15 - 15.5 oz) washed & dried aluminum cans with non-stick cooking spray, or use a paper towel to grease with oil. Make a well in the center of the dry ingredients and add wet ingredients. Stir to thoroughly combine into a thick batter. Add about 1/3 of pumpkin bread batter into each can. Place cans in a 4-quart slow cooker. 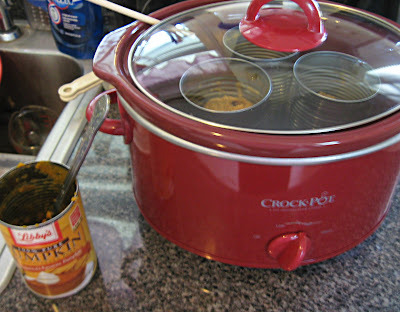 Add about 1/2 cup - 3/4 cup warm water around the bottom of the cans. Place the lid on the slow cooker and add a chopstick right underneath the lid to allow excess water to escape. Cook the bread on high for 3 1/2 - 4 hours until the bread is cooked through and a toothpick inserted into the middle of each can comes out clean. Allow the cans to cool for a few minutes before carefully removing them using a potholder. Gently shake bread out of the cans onto a plate. Cut each loaf into 4-5 slices and enjoy! Store pumpkin bread slices in an airtight container in the refrigerator for up to one week. This bread also freezes well for up to 6 months. Preheat oven to 350 degrees. Grease 12 serving muffin tin and set aside. In a large mixing bowl whisk together ALL dry ingredients until well incorporated. In a medium sized bowl mix together all wet ingredients. Fold wet ingredients into dry ingredients until mixture is thoroughly moistened. Muffin batter will be thick. Scoop 1/4 cup of batter into into muffin tin for 12 large muffins. Would this recipe work using 1 and 2/3 cups all purpose gluten free flour instead of the brown rice flour and arrowroot starch? YES! it should work just fine using an all-purpose GF flour mix... just make sure if your mix includes xanthan gum to leave it out of the recipes (same goes for baking powder, baking soda, etc... ) let me know how it works out for you and what mix you used! Thank you Heather! it really is fun and you're right... it is DEFINITELY the time for pumpkin recipes!! Mmmm! Have you ever tried anything other than "tin" cans? I try to avoid canned food as most of it has BPA in the lining and even those few canned foods that are in BPA-free cans have some sort of lining to prevent a metallic taste. I wonder if wide mouth glass jars would work? Yummmm! This looks so good, I will have to try this! Thanks for sharing. Cheers!